Dance North's 'Dust'. Photo by Pippa Samaya. 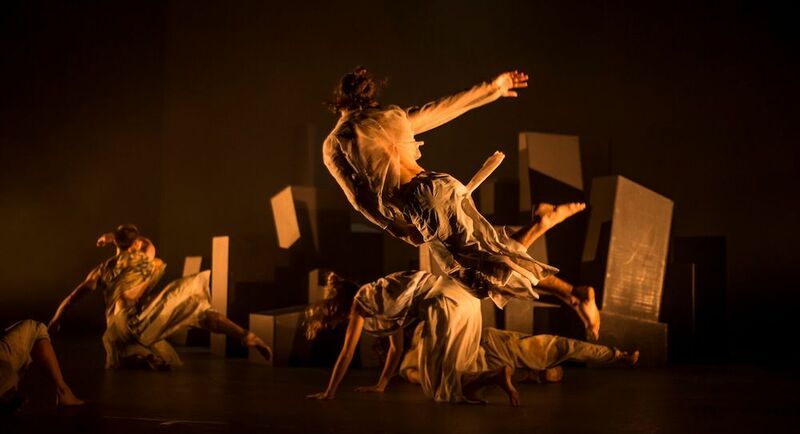 Under the direction of the ever-innovative Kyle Page and Amber Haines, Townsville’s native Dance North presented Dust, the newest instalment in the company’s repertoire. Dust did not disappoint. Premiering at Sydney Festival, Dust explores collective human relationship – our gut-level, instinctive interaction with environment and experiences, the collective response versus the individual experience of the world, and our tribal nature. With stunning detail and symbolism, Dust is an introspective work, exploring the subtlety of our interactions and how they shape our experience of the world. There were some moments in the work that were absolutely breathtaking – glances, alongside open and held connection, weaved throughout the narrative. Individuals shone in solo moments, some that isolated, and others where the inclusivity shone. The work was sectional, woven in such a way that included an incredibly diverse range of experiences, whilst holding a common thread. Tangible emotion spoke in raw, open and honest explorations of isolation, group-think, introversion, and un-restrained, raw response to hard situations, hinting at all facets of the current human condition – mass migration and its effects on the individual, isolation in an increasingly busy world, less and less organic interaction. Dance North’s ‘Dust’. Photo by Pippa Samaya. The work opens with group v’s the one, on either side of a huge wall which was covered in a sheet of material. The wall eventually becomes uncovered to reveal a brick wall, with varying shapes and size bricks. These are then taken out one by one, and the wall is moved aside. Throughout the work, the bricks are moved around to create new settings, and in this process, task becomes the focus. The more it becomes so, the less organic the interactions become, until just being becomes something unnatural, highlighting the need to explore other ways of being. It was very refreshing to see emotion and response explored in such an open and uncontrived manner. 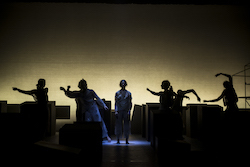 The set, created by Liminal Studio, was simple but entirely clever, facilitating each change of destination like a morphing creature with a life of its own, despite the fact that the dancers worked each change as a part of the journey. Along with the set, music was very much a collaborative process, violinist Jessica Moss creating a score that moved with the dance, ebbing and flowing as it unfolded. Part electronic, part live performance on her instrument, Moss was very much in-tune with what was happening in the space, the soundscape itself an integral performer in the work. The composition was finely balanced between the emotion, the technically demanding work and the conceptual journey. A unique and new movement vocabulary seems to be emerging from this cutting-edge company that is, from one perspective, a natural progression in the decades old task of finding and exploring new movement on a macro level, but another that is influenced by other, less obvious expressions and changes in movement on a micro level. There is a tension and staccato that permeates the choreography, hinting at a hip hop technical influence but still is something altogether new. The stylistic voice of the movement is so much a part of the work that it conceptually speaks its own voice, alongside the macro level of the choreography, adding a unique tonality and hue to the work. 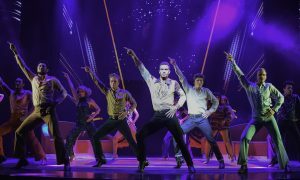 Where most choreographers might be satisfied in adding dynamic as a final touch, in Dust, Page and Haines give dynamic a starring role. Dance North continues to go from strength to strength in its work. With individual company members who bring a point of interest on their own and as a whole, the collaborative strength of each work continues to gain momentum with each new offering. It is wonderful to see individuals shine, alongside strong company work and a cohesive vibe that comes with creating work as equals. 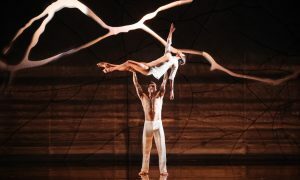 Dust was a wonderful and stunning experience, with a well-deserved full house and sold out season this Sydney Festival.